berhind 1 year, 6 months ago. Android Nougat 7.1 ROM, Lineage OS 14.1 for Galaxy TAB PRO 8.4 WiFi has now arrived via an UNOFFICIAL build. If you want some more Lineage OS ROMs or wanna taste the OFFICIAL Lineage OS build then stay tuned to the Lineage OS 14.1 ROM Devices list page. This Galaxy TAB PRO 8.4 WiFi Lineage OS 14.1 is brought to you by developer Migush. If you like this ROM, then do consider a donation to Migush. THIS IS AN INITIAL BUILD WHICH MAY HAVE MANY MORE BUGS THAN YOU CAN IMAGINE. HAVE A BACKUP BEFORE FLASHING THIS AND TRY AT YOUR OWN RISK. Installing a custom ROM on a Galaxy TAB PRO 8.4 WiFi (mondrianwifi, SM-T320) may require the bootloader to be unlocked, which may VOID your warranty and may delete all your data. Before proceeding further you may consider backup all data on the phone. You are the only person doing changes to your phone and I cannot be held responsible for the mistakes done by you. Download and Copy the GApps and Lineage OS 14.1 for Galaxy TAB PRO 8.4 WiFi ROM ZIP to your phone. First flash the Galaxy TAB PRO 8.4 WiFi Lineage OS 14.1 ROM ZIP from device. Then flash the GApps zip from your device memory. Reboot and Enjoy the Nougat 7.1 Lineage OS 14.1 ROM for Galaxy TAB PRO 8.4 WiFi (mondrianwifi, SM-T320). 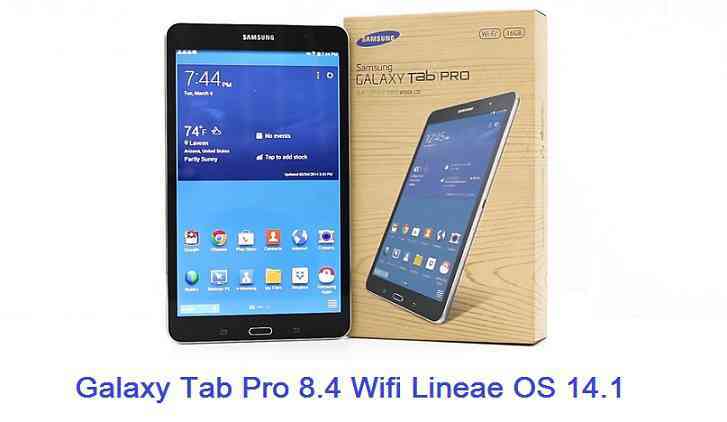 Copy the latest Lineage OS 14.1 for Galaxy TAB PRO 8.4 WiFi ROM ZIP file to your phone. Stay tuned or Subscribe to the Galaxy TAB PRO 8.4 WiFi (mondrianwifi, SM-T320) forum For other Android Nougat ROMs, Lineage OS 14.1 ROMs, other ROMs and all other device specific topics. Hi… first time posting! I tried this ROM and the flash/install completed without any hiccups. The system looks and feels great! Im using pixel home screen and my tablet feels like a brand new device. Honestly, So much quicker than stock 4.4.2 or whatever it had on before. ALSO Thank goodness i dont have to deal with Samsung’s magx or whatever it was called. Ive only been using 14.1 for a few days and everything seems solid, tho i do have some notes to share. 1. Camera – Front or rear wont work. It gives me the error of “Camera Error – Cant connect to camera”. 2. Battery Life – It drains quick. I have it in Balance mode and it drains considerably more than before. Now this could be because its a much newer OS and thats just the way it is, but im not sure. What Lineage ROM I can use for Samsung GT-I5500? First, I am pretty new at this but went ahead after reading and re-reading. Everything works great. I do have a minor problem. I have no usb debug option under Developer options so I can’t transfer files from my laptop. I hope someone can provide some direction. I have the tab 8.4 working but I have one major issue. From lack of experience, I turned extensible storage which now prevents me from doing any updates since TWRP doesn’t recognize extensible storage. This issue has been resolved . issue resolved. you can format the sd card and make the card personal storage. Just need to copy everything first to a holding space, format, and then copy back after you format. Sorry for replying you back so late but it’s good to know that you have fixed the issue by yourself. As you said you are new here, I will say there is a lot of learning scope you can explore in the process of doing all these :). The Camera won´t work (back or front), It gives me the error of “Camera Error – Cant connect to camera”. Does anybody know how to fix this? I’m having crazy crashing issues… crashes as in like my system wont boot. It just random as i will be fine for a few weeks then boom, gets stuck at the “android” loading screen. I reformat/recover from backup with twrp and happens again in a day or a week later. Im currently repeating this over and over again for the past 2-3 months. Im finding that it only happens when the device is left on. It doesnt happen when i turn the unit off when i walk away from it. Its never happened while in use, just when it sits idle.